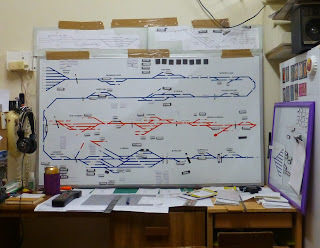 Yesterday I had a work colleague and one of his son’s visit for a short time to see the layout. The little fella – Liam got to run a train or two and I think he had some fun. It was during this running that I had the same situation occur that last occurred on Friday night during the Running Session. A loco fell from the track and landed mid air within the Cougal Spiral. Different Loco same place. I then had a closer examination of this location and there was definitely a kink on the track. It seems that the heat has potentially caused about two or three sleepers to come away from the track and the track has developed a kink at this location. This morning I jumped inside my spiral and added a few extra nails to the track and re-aligned the track at this location. I tested it by running a string of 6 ballast wagons through the spiral by themselves under gravity (at speed) and they ran very nicely without any hiccups. One of my main outstanding problems had been solved - Whoo Hoo! Also this morning, once I fixed the track issue at Cougal Spiral, I decided to spend an hour trying to motivate myself towards some progress at solving the Power District 3 and 4 cross connect issue. I started tracking the power bus for Power District 4. Upon reflection, I did not have many jumpers from the bus to the track in this district. So I identified 5 more locations to add jumpers and then I got to the hard to reach locations. Tomorrow I will identify more locations to locate these additional jumpers and if I don’t have anything else to do, I will then install these jumpers for this entire block - soldering the jumpers to the power bus. I think there is also a small section of track in Border Loop on the main line that I will replace as there are a few kinks in one of the rails. Better replace it now while I remember. 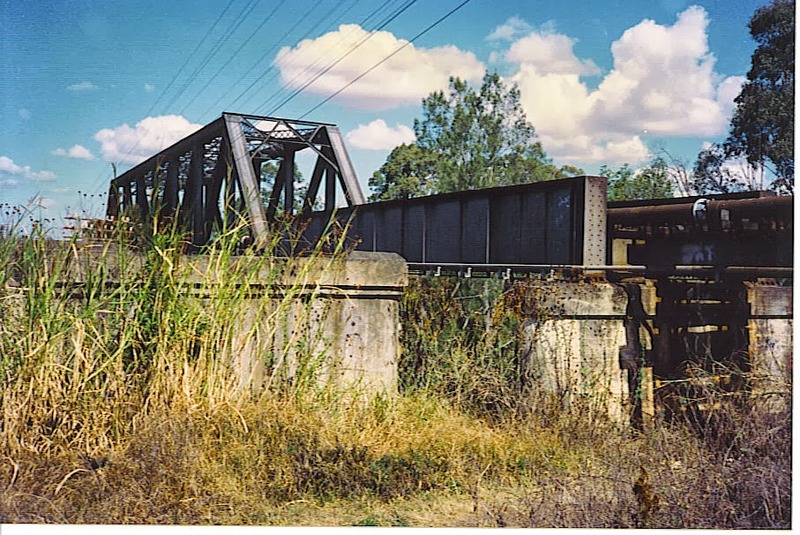 It was soon after this point when I drilled the holes for the first few jumpers of the Power District 4 that I came across a location – Kyogle Stock S iding, where I have jumpers from the Main line to the Loop line to ensure that the loop is powered. I then found another jumper from the Main line to a location within the top level of the Cougal Spiral. These two locations are about 8 inches apart behind a styrene and plaster view block. For those wondering, Kyogle Stock Siding is in Power District 3 and Cougal Spiral is in Power District 4. As one famous TV character says – Bazzinga! I found my cross connect. Whooppie! So out with the snips and the two power districts were now totally isolated from each other. After a test to confirm that this was the only location - I had now solved my two outstanding major problems. What a way to end the year! Tomorrow I will also start adding droppers from the track within Power District 3 to the Power Bus as well. Once this is completed – potentially next weekend, my track and power related activities, I think, can go into hibernation. I can then resort to spending some more time finishing off on the plaster work around the Lismore to Murwillumbah area and make the layout look more scenically complete. There are plenty of other jobs to do scenic wise, and then about 50 structures to build I would guess. I also have a few more bridges to build around the northern side of Lismore. I have no problems with building structures, just painting them so they look realistic. I guess I will have to take some lessons from two excellent modellers (that I am lucky to be able to say are my friends) Jim Hutchinson and Mike Boyde, in the new year on that very topic. Today I had another two modellers come over for a small running session. Anthony (whom was a last minute cancellation from Friday night's session) and one of his running crew Mark visited just after 1:00pm. I gave Mark the initial tour, got him to sign the standard Indemnity Form and we were then able to run trains. We had some trains that were part way through the running session from last Friday, so we worked them. Then we started on some others. Given that these two guys were the only two running trains, there were no crosses occurring. But we had a couple of incidents with some track cleaning being required in the Old Cassino to Lismore section within the hidden spiral. This dirty track caused rough running of the loco and we lost the last two wagons within the hidden section. We did not know until the following train ran into them. This following train also experienced some rough running in that area. I will clean that area tomorrow. Well that is about it for 2013. Happy New Year to all my crew, to the readers and most of all to my family, especially to the Financial Controller whom allows me to spend time down the shed each weekend and spend a dollar or two on the empire. The crew started to turn up from just before 7:00pm for the Running Session. I had two first time attendees at this session. However, before the session started, Greg showed off his recent purchases of a Walkers Railcar. It was popped onto the track between two of the Running Creek Tunnels and sent for a run towards Border Loop while we were waiting for the full crew to roll up. A photo of the railcar courtesy of David Head (one of the virgin running session attendees). Slightly late we started pulling timetable cards and the various crew started conversing with North Coast Control. We had 9 crew in attendance along with me. Two were no shows through various reasons. Greg went to North Coast Control and was showing the ropes to Darryl. I think everything started off quite well until various trains had to cross the Richmond River Bridge. All the trains were stalling on the bridge. 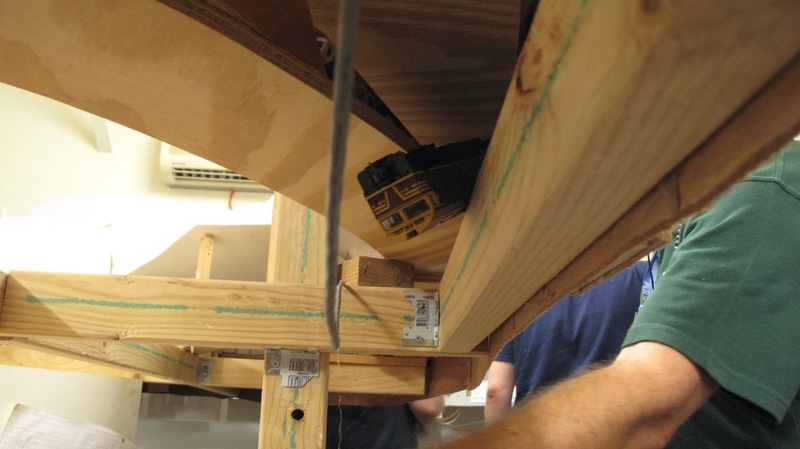 One of the rail joints needed to be slightly adjusted and eventually it provided constant electrical connectivity across the bridge. During the night, two headset plug in points failed. From one you could hear and not be heard, and the other you could speak but not hear anything. These were fixed yesterday in going through the wrap up from the session fixing or investigating all the various issues documented by the crew. Perplexingly there were a couple of trains travel through to the wrong destination. The Rail Train was due to travel from Clapham Yard to Kyogle and terminate in the yard track at that location but it continued through to Fairy Hill Loop. What gave it away was the driver asking for permission to reverse back up one block section. Another train, the branch fuel train, after dropping off its first four petrol pots at Old Cassino, was spotted heading north of Cassino towards the Hotham Street level crossing towards Brisbane and actually running the points at that location and causing a short. Talk about drawing attention to yourself – hey Shelton - twice! When thinking about where locations are on the layout, I think the layout is fairly well sign posted. There is the North Coast Control mimic diagram. There is also a string diagram of the layout from Grafton to Acacia Ridge - it doesn't yet have the trackage north of Acacia Ridge to South Brisbane - around the outside of the helix. Each major crossing loop has a diagram stuck to the facia (somewhere near each location - either above or below) with most sidings in that location identified. There is also a sign at each crossing loop, that identifies what the crossing loop in each direction is called. We also had an interesting situation occur in the Cougal Spiral. One of the locos from NL1 fell off the track. Don't ask me how that occurred. Although later as I was adjusting the location of NL1 for a resumption of the timetable in the future, someone had put some cars on the motorail car and these kit the layout frame within the Cougal Spiral and caused issues with a massive derailment. There were a few really big issues that occurred during the session, one that almost caused the cessation of the session totally. I run an NCE 5 Amp system and have quite a few attendees bringing their radio throttles to control quite a trains. I find it better to use radio instead of plugging and unplugging constantly around the layout. However, my radio system base station has never been upgraded to Version 2.0 (or later) and because of this, there is a known bug that can occur – that I have had occur many times – mostly when I am running trains by myself, so it is easy enough to control. However, what occurs is we get a runaway situation when a loco just fires off at full speed. In a few occasions on Friday night, a few locos did just that. Because these locos were just sitting in sidings at the end of a run, there was no driver associated with the train. These runaways were not found immediately. The issue that we had was all of a sudden we had some power districts start pulling huge Amps. The whole layout was fluctuating between 3.5 and 5 Amps. This was causing low voltage on some sections of the layout. I know I have an issue with two power districts that are somehow electrically linked - and I have not yet wired up the power bus for these districts. This is a situation that I must investigate but I have not got around to it. It just so happened that these loco runaways occurred within this district. We could not find any cause for the low voltage situation. However, I eventually found the culprit and moved the runaway train off the points it was shorting on and everything came back working. While this investigation was occurring, the crew took a break. The crew were almost revolting - I guess they were not that bad! The NCE radio bug, can be mediated by crews selecting the address of another loco that does not exist on the layout as soon as they are finished with their timetable card and have parked their loco. What we did discover from the session is that there is more text that can be added to a few of the timetable cards to provide some assistance and direction to the crews. These will be updated next week. I will also add some more information to the mimic panel to advise the Controller that certain locations on the board are sidings and not crossing points. Some locations are only 600mm long! All in all I think everyone had a good time. 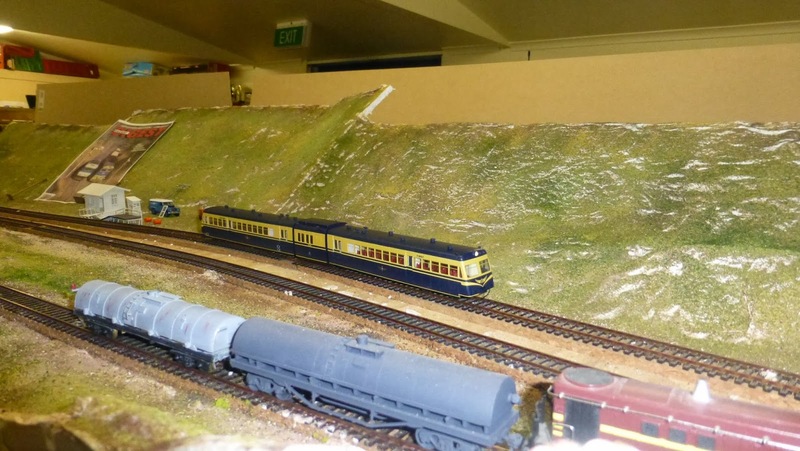 The sessions are only as good as the crew that turns up, and I always have a great crew, who enjoys the task of trying to operate a model railway as would have occurred back in the mid 80's early 90's on the North Coast of NSW running through to Queensland. David Head also runs a blog and he has provided an update of the night. Link to David’s Blog. With Christmas Day and Boxing Day this week, I was able to find some spare time and travel down to the Shed and complete the last few tasks before the running session was due to occur on the Friday. So on Christmas Morning after the kids opened their presents I was able to get to the Shed for about an hour and a half. I wired power to the last 7 point motors around Clapham Yard and Loco Pilly. I connected the first four motors up to the DS64 point controller. These were allocated addresses and tested. I then coded up the mini panel so the push button controls from the Loco Pilly panel through the various point at the northern end of Clapham Yard and the first two sidings in Loco Pilly. These worked like a bought one. I then wired up the next three point motors to the second DS64 point controller. These were also allocated addresses. However, whenever I tried to fire the points, the LED on the DS64 did not light, as it does on my other DS64's. I can only assume that it is not getting the addresses I set it up with. I just hope this is not another warranty claim as this is killing me posting this stuff back the US. On Boxing Day in the morning during the first session of the cricket I then found a wire off my Master Layout Voltmeter. Why not use the TV in the shed if you have one! The next major task that I had to do was to setup the train number magnets on the master layout minic panel used by North Coast Control with the all trains magnets placed in their starting locations in the various display panel sidings. I then had to go through the train timetable cards and remove the various trains that I had decided that we were not going to run during the session. I use two sets of timetable cards. One that the drivers use and one for North Coast Control to refer to so he can see what instructions the driver is also seeing on the timetable card. The cards say things like what siding to take and what wagons to drop off or pick up at what locations. I think that makes it easier for North Coast Control. I had always been experiencing issues with the auto reversing unit located at Acacia Ridge Yard when it did not always throw when a train entered Acacia Ridge Yard from the south sometimes stalled upon entry at the section boundary. During the week I printed out the single page instruction sheet for the auto revering unit. I then knew what way to turn the variable resistor located on the reversing unit and adjusted the triggering current downwards and then ran a test train. Again - it worked just like a bought one. I had no idea why it has taken me so long to adjust that setting. All was now set for the Running Session the next day - the 27th December. From memory I think I also went down to the Shed on the morning of the Running Session to potter around for an hour or two while watching the cricket. Well time is certainly running out before the next Cassino running session later this week. Family events and other activities are certainly conspiring against me and making it hard to get everything completed before the running session. Yesterday I had one child off to a kids birthday party (with the Boss) and I was confined to home with the other. However, I had a visitor from Melbourne pop in for a few hours in the afternoon, so I could show off the layout and also having the opportunity to see a Eureka R class loco running on the Murwillumbah branch from Lismore to Grafton. I think it must have been offloaded from a barge near the Lismore Wharf siding and after a few runs up an down the loop, it made it’s way towards Old Cassino and then onto Cassino and eventually around to Grafton where it finally rested. The loco looked nice, ran very well especially at slow speed and I was very impressed by the sound - plenty of volume but it was set a bit too high for my likings. However, having never heard an R class in 1:1 scale before I don’t know how accurate the sound in the model is. It must have been a steam day yesterday as I broke out the Garratt and double headed it with my 35 Class and ran them from Grafton for their first trip across the Richmond River Bridge before making it into the platform at Cassino. They then ran back to Grafton Loco. That was the first steam loco activity on the layout for quite some time. So this morning early I went to the shed before heading off to a family gathering for the Mother-in-Law’s birthday celebration at midday. I got around to moving the last few trains into their initial starting location before the running session. I found out my layout Voltmeter had stopped working so I will investigate that over the next few nights. I still have to wire up two points on the main line, and I would like to get at least four completed, if not 6 before Friday. 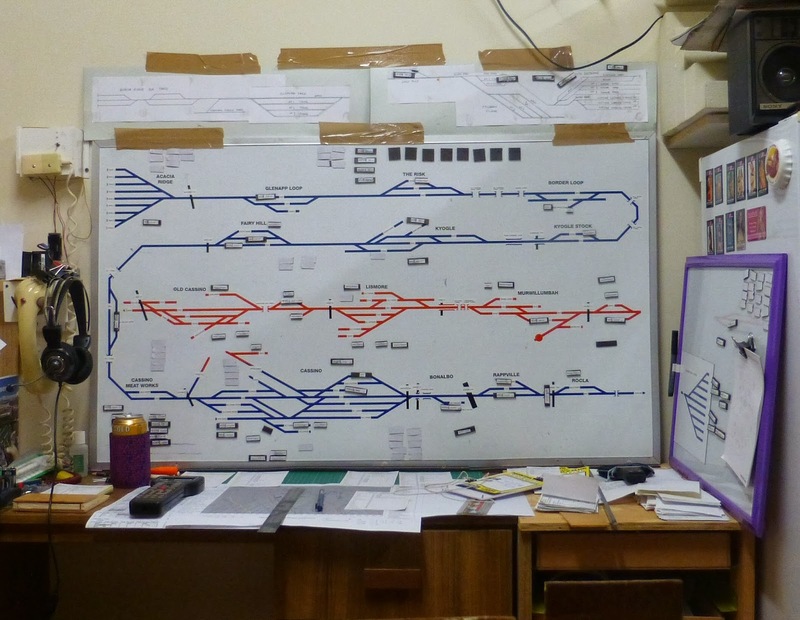 I must remember tomorrow to print a new train diagram for the Friday Operating Session and print the timetable cards on the four part paper so I can rip them up and have them ready for the Operating Session. I still need to investigate a fault between Power Districts 3 and 4, but if that doesn’t get done before Friday its is not s show stopper as the layout will still operate. My next blog update will probably include photos from the operating session and a wrap up of the event. I hope you - the readers - get some enjoyment out of visiting this blog, and even if NSW North Coast modelling isn’t your thing, the links that I provide cover off on your prototype calling. Merry Christmas to everyone that visits this blog and reads the diatribes that I post every week. Yesterday was the date of the Annual RMCQ Modelling Competition and Christmas Party at the Clubrooms. We had a great turn out of members, and a great range of diverse models. We also had quite a few donations of goods for the various Christmas Hampers. From about 1:00pm I was talking with a subset of our HO members about the new HO Clubroom layout. We were discussing some of the electrical items on the agenda. I tendered a schematic for the location of the UTP's on the layout along with suggested input points for 12V feeds to the cab bus. This was followed by a suggestion for the location of the five power districts on the bottom deck. Then we discussed where we would locate the Command Station and the EB1's which we will use for the circuit breakers for each power district and also the potential location for the Booster. One of our resident electricians advised he would start looking into providing power circuits under the layout from our existing wall power points. This is a scratch built crane that looked very nice indeed. The concrete batching plant that I think took out one of the awards. This duo of models were not in the competition but were by the prolific expert modeller Jim Hutchinson. On the left is a QR signal cabin based on the one at Dalby in south western Queensland. The one on the right is a model of the Glenapp Signal Box on the Uniform gauge line south of Brisbane. This just happens to be a crossing loop on my layout. I know where that model will be going. This entry was a bitbash activity following the instructions from the various AMRM articles last year and this year of one of the Sleeper carriages based on a Lima coach. See, some people do build models from these articles. This small N scale diorama was an entry in the modelling competition and was very nice. This was another entry. A small N scale layout with a train that was doing loops. There was some very fine detail on this layout. It just proves that you do not need too much room to have a working layout. Following the Modelling competition, we had the Christmas Hamper draw. This year I think we ended up with about 7 separate hampers. We then had a couple of re-draws as one hamper contained a slab of XXXX Gold and the winner was not a beer drinker. So it was redrawn. This was followed by a separate 6 pack of XXXX Gold. Unfortunately I did not win anything this year. Before the meeting, Jim Hutchinson provided me with 20 Bulletin Magazines and 30 Australian Railway History Magazines. These were mostly from the 1990/91 period with some from 2012/13. I read through all of them last night. I was able to glean a good amount of information from these magazines that covered Cassino and a number of crossing loops within my area of modelling. Some of these facts will be used when I redraw my timetable sometime next year as I now have details of some of the XPT time trials through Cassino back in 1990. Most of these will end up in my magazine library. This way I can run both Brisbane Limited and XPT trains at the same time. Today my only activity was to go to the shed and re-install my Bridge across the Richmond River as it was also entered into the Club Modelling Competition yesterday. I am having too much fun watching the Poms get flogged in the Cricket. I'm tipping a whitewash for the series! This weekend I went down the Coast with the family for a short break. We stayed at Coolangatta, right across the road from the beach and as the wife had planned it, also across the road from where the Gold Coast Craft Markets were held today. We certainly gave the markets a nudge this morning before heading off to the beach and then back to the pool, before watching some cricket. So this week there has been nothing of a modelling persuasion undertaken. The only thing I did was on Friday when I removed my bridge over the Richmond River and separated it into its three pieces and packed it up so I can take it to the Club next Saturday for our modelling competition. Plans for this week include catching up on reading with the latest AMRM magazine as well as the December Digest and the October issue of Australian Railways Illustrated. This magazine has an article on the Northern Rivers Railroad which has some very nice photos taken around Casino and other north coast locations. I also have to install a small decoder into a Club member's British loco as time is running out before I need to return it to him next Saturday at the Club. Very little to report this week. Yesterday it poured in the morning so I did not go to the shed. In the afternoon I made use of the fine weather and put up two sets of Christmas lights out the front. I had previously put up two sets of Christmas lights on Friday afternoon. Today while catching up on some recorded TV, the phone rang off the hook. I answered an SOS from old Mike Boyde. He was after a few sets of HO bogies so I took three sets over to him. I then helped him re-setup his Powercab on a very small shunting layout located in his garage. The second phone call was from Lefty. He needed to use some of my consulting services on his layout. That was no problem at all. He already knew the answer, but he just needed to hear it come from someone else. In an effort to inspire him to actually cut some more timber track bases on his top deck so he can put the next 15 feet of his track bases in along with his very large On30 scale station module,which is about 4 feet long and 1 foot deep, I gave him some free advise as to how I would cut the various baseboards etc. It really would be great to see some more benchwork progress and an update to his blog - hint hint! I did spend about 30 minutes in the shed today before I put my consultancy services into action. I screwed my two recently purchased DS64 devices for the Loco Pilly up underneath the layout's top deck. I then cut some wires and connected up the DCC supply to both of these DS64's so that are now basically operational. I then turned the layout on to ensure that there was no short created by adding these items into the track bus. I still do need to code up the DS64 device address and the four point motor addresses on each, but that is a job for the next time I visit the shed. 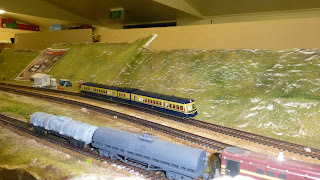 On Tuesday this week we went to a new Tuesday Nighter's place and checked out his HO scale NSW layout. The layout was very well detailed and his rollingstock while not making the leap into DCC yet, ran very nicely and was extremely well presented - including nice weathering on some items. Something to aspire to eventually when I get some time. This weekend was pretty busy as we had a number of parties to attend. It all started with me attending a Work related Christmas Party on Thursday afternoon. This was followed by Divisional Christmas Party on Friday lunchtime. Saturday was a family get together for a surprise birthday party for my Great-niece. It was a wonder I was not pickled by last night. While at yesterday's party in the early evening, we could see a huge thunderstorm approaching. As it turned out, it was lots of rain and not much else. in our area. Some party goers sat on the large outdoor deck and watched it pass, while I went inside. Today was an early birthday party for Kyle at the local 10-pin bowling alley. He got some very nice presents from his class mates and I think everyone had a ball. So this weekend was not a total wipe out. Before yesterday’s family outing, I did spend some time in the shed. This was to connect up the new NCE mini panel into the cab bus. I did get a small six-inch cable made up at work on Monday this week and that was added to the cab bus between a pair of RJ12 splitters that I get from Harvey Norman for $6.95 each. That works out cheaper than a PCP for about $20. That is a simple method of creating short branch in the cab bus. Standing next to Cassino and looking toward the corner of the shed we can see the work area. The DS64 on the left beneath the 44 class loco, the Mini panel and the two control panels Clapham Yard North control panel in the middle of the picture and Loco Pilly control panel on the right. On the left of this control panel is the intermediate staff machine for Loco Pilly. This staff machine services the section Clapham Yard to South Brisbane. On the level below we see Glenapp Crossing Loop. On the facia below that is a plug in point for the headphone system used by drivers to communicate back to North Coast Control when crossing trains in the timetable run. Now a view from up above. This view shows the point layout of the northern end of Clapham Yard. Again we see Glenapp Loop on the level below and on the bottom level we see the southern entry into Cassino. Next I fired up the NCE system and set the mini panel’s address to 60 on the cab bus. This was followed by entering the commands for the 6 buttons on the Clapham North control panel. Next I entered an address for the DS64, and logically entered the four addresses into it:- 1211, 1232, 1233 and 1234. So I then undertake a test on the DS64 from the Clapham North Mini Panel. I expected that when I hit a button that a point motor might throw in the opposite direction. However, I did not expect the wrong points to throw. Then I realised that while I numbered the four addresses correctly on the DS64, I wired then 4,3,2,1 instead of 1,2,3,4. That came about as the DS64 was turned upside down under the top level baseboard. That was easily fixed by swapping the four outputs into the correct order and then after another test from the control panel, swapping the various outputs so the points threw in the correct direction. Silly mistake, but I always make them and it is easy to fix up. A close up of Loco Pilly control panel. There is a standard on/off switch on the bottom right hand corner to isolate the control panel from the mini panel. The black push button controls the Main Line into the northern end of Clapham Yard. The rest (red) are for the various tracks inside the loco staging area. This is the Clapham Yard northern panel. A photo of the Clapham Yard southern panel. With a few minutes left before I had to get ready for our party on Saturday, I decided to connect up the 7 pushbuttons from the Loco Pilly control panel back to the local Mini Panel. That also was easily accomplished. I will eventually have to get around to moving all the various wires currently laying around under the various levels of the baseboard so they are tidy up under the baseboard and out of viewing range. I still have lots more activities to undertaken before the next running session. Apparently my next 2 lots of DS64 point controller are very close to being delivered. Once they are installed under the layout, I have to run wires to the various point motors and give them a test. The plan is to do that next weekend. The next major task to complete is laying the third rail in track three within Clapham Yard. Work will then turn to fixing the yet to be found back feed issue between power districts 3 and 4. I might need to call in some assistance for this as generally a fresh set of eyes coupled with a walk through of my wiring logic will almost make the cause of the problem stand out like the proverbial dog’s appendages. Well my plans for building my control panels (for the Northern end of Clapham Yard and Loco Pilly) during the week did not eventuate. However, on Saturday after returning from a trip to Austral Modelcraft to pick up a Club order for 15 x DCC decoders for the Club Shop, I drilled the holes in the two control panels for the Northern end of Clapham Yard and Loco Pilly. I then fitted the push buttons. Following this I made a trip to Harvey Norman and picked up an RJ12 splitter, as I need to put a fork in my NCE Cab bus to connect the new NCE Mini Panel which I also picked up this morning at Austral Modelcraft. This mini panel will be located at the northern end of Clapham Yard. I will create a small 8 inch RJ12 cable at work on Monday from a small length of Cat-5 cable. This will allow the Cab bus to be spliced with a short fork to the Mini Panel. I also went to Jaycar to pick up some more wire and an extra couple of push buttons as I did not have enough to complete both control panels. A couple of my push buttons just seemed to have self destructed, with them splitting in half. This makes them unusable. The mini panel was mounted on the facia of the top deck, where I can get access to the screw in terminals for the various input buttons from the two control panels. This morning I soldered up the common power supply for the push buttons on the control panels this morning while watching a replay of last night's Rugby Union on TV. My darling wife was heading out this arvo so she picked a small hinge from Bunnings. What a women! This hinge allows me to mount the Loco Pilly panel to the layout facia. I use a hinge to allow access to behind the panel and the wiring. This afternoon, while watching the Golf, I mounted the two control panels, and attached the common power supply to both panels from the Mini Panel. I then laid the 6 wires from the push buttons on the Northern Clapham Yard panel and connected them up. I also cut another hole in the baseboard for a Peco point motor in the Loco Pilly area. I have one more point to lay in the loco area. When I get it I will also cut the last whole in the baseboard for that point's point motor. Four point motors were fitted to various points in the Loco Pilly area, and the wires that I laid from the DS64 point motor controller which was installed last week, were soldered to four different point motors in Clapham Yard. So the last few tasks to complete the Loco Pilly area and Northern end of Clapham Yard are coming to an end. I dearly want this area fully operational before the next running session on the 27th of December. I still need to wire up quite a few point motors back to two DS64 point controllers (that I'm waiting on delivery), connect the Loco Pilly Control Panel push buttons back to the mini panel and code up the mini panel. These tasks should certainly be completed over the next 2 weekends. I still need to lay the third rail on one of the tracks through Clapham Yard. That is not such an important task as I still don't have a 12mm loco to run. I'm still waiting for Southern Rail Models 2300 class loco to be delivered. The cricket starts this week. Hopefully we will give it to the Poms at the Gabba. I'm not sure if I will head out to the Gabba on Thursday or just watch it on TV. Well what occurred this weekend? Saturday was Club day across the other side of Brisbane - a one hour drive each way - I must be a glutton for punishment. So while at the Club I installed two NCE N14IP decoders into a 44 Class loco and a 42 Class loco for one of the club members. That is a very easy job. It takes longer to remove the shells than it takes to install the chip. Both tested OK. I was also given a small British Loco (0-4-0) to install a decoder into. Over the next few weeks, I will obtain a Z scale chip from the loco hobby shop and install that for another club member. I’ll have that done by next month’s meeting. Our Club HO layout continues to have track laid and progress. Various suggestions are made via a Yahoo forum and constructive comments are made and final decisions are made by the members present each meeting day. We made a few decisions on the Clubroom HO layout in regards to the point work design at either side of the main station. I think as soon as that is done, we will have the bottom level of the track complete and we will theoretically be able to runs trains. Attention now turns to the location of the various power districts and a numbering standard the various blocks for future point automation. I think that will be ratified at the next meeting in December. Others will be working on installing droppers over the next four weeks or so. What about on the home front? I had a school working bee this morning and came home and eventually mowed the grass after my temperamental mover finally started. I finally got to the shed after the first storm from the south hit this arvo. We were on the outer edge of that and it did not cause us any issues. We also were on the outer edge for the second storm, that time to the north. This was only about 5 minutes worth of light rain. The first railway related task was to install a piece of bracing under the Loco Pilly baseboard area as this area has sagged a bit. It certainly had the desired effect. So the plan today was to work on the control panel at the northern end of Clapham Yard - actually I did not touch this at all. I first installed my remaining Digitrax DS64 4-point controller under the baseboard. I drilled a few holes in the various layout supports to run the various wires for the point motors. This DS64 point motor controller will control one point at the southern end of Clapham Yard and three points at the northern end. I ran wires to all the point motors and ran wires to connect the DS64 to the track bus. The wires while attached to the DS64 have not been soldered to anything at the other end as yet. I have two more DS64's on order and that will complete the point motor control for the layout. While I was looking at the control panel for the northern end of Clapham yard, I was contemplating creating another separate control panel for the Loco Pilly area, instead of having everything on a single panel. All the push buttons in this area 13 - need to be connected back to one of my Mini Panels located quite some distance away. This mini panel has a number of free wire inputs. I would have to run 14 wires (including the common) each about 12 meters back to the mini panel. These wires have to follow the baseboard around a rather long 'U' around the second level of the baseboard as the Mini Panel is located beneath Border Loop. Access to some of those areas was going to be a real pain - particularly when I needed to run so many wires in a repetitive process. It was also going to cost me a small fortune in wire. I have now made a decision to purchase another Mini Panel and locate it at the northern end of Clapham Yard. I can then wire all the pushbuttons located on the two control panels with only one reel of wire. I wish I could have made this decision quite some time back as I would not have had to run 7 wires from the control panel located at the southern end of Clapham Yard back to the mini panel located at Acacia Ridge Yard. I then would not have had the issue with the over writing of the Mini Panel commands for Clapham Yard and the required rewriting of the Acacia Ridge Yard commands. Oh Well! Sometimes it is easier to spend some money and not just take the cheapest solution. Everything is better in hindsight. Next week I hope to install the mini panel (if Ray has one) and I plan to solder all the wires from DS64 I installed today onto all the point motors. This week (maybe even later tonight) I will be drilling out my northern Clapham Yard panel and the Loco Pilly panel to allow installation of the various push buttons that I already have. I can then solder these up sometime through the week if there is nothing on TV to relax in front of. We also have Tuesday Nighters this week at Geoff's. One of the issues that I found last weekend was that when I threw some buttons on my Acacia Ridge Panel, points in Clapham Yard fired. So yesterday, point by point I entered the accessory address of the various points in both yards and they all fired at their correct address - all except one point in Acacia Ridge Yard. As I threw that point, the light on the DS64 signifying that it received a valid address did not light. So from that deduction, it looked like one of my DS64’s had lost the address of point number one. So I recoded that DS64 to the 4 correct point motor addresses and all was then OK, except my hitting buttons in my Acacia Ridge panel caused points at Clapham to fire as well. I scratched my head as to how to figure out what had happened. So to debug this further I plugged my Procab into the Mini Panel and started reviewing the commands. The commands that were showing as entered for the first 11 triggers were correct, but slots 12 through 16 were wrong. Somehow they had incorrect instructions in them. Oh I remember, I overwrote them. Doh! I then realised that when I plugged the push button wires from the Clapham Yard into the Mini Panel, I plugged them into 5 free trigger inputs in the Mini Panel. I forgot that I had commands associated with the Acacia Ridge Yard already entered in them that I linked to from 7 other triggers to throw common points in a cascading fashion. That was a prime stuff up - even if I do say so myself. Luckily I had recorded the original commands for slots 12 through 16 in a spreadsheet. Upon closer examination, instead of using a large number of links, I could have just entered the common accessory commands into the slots for 7 slots that linked to slots 12 through 16. That allowed the freeing up of those original slots for use by the Clapham Panel. I was just a major dork by over writing the original commands. So I reprogrammed the Mini Panel and everything is now working correctly. I can't believe that I actually did that! I also checked out the block boundary between power districts 1 and 3 with my trusty Multimeter set to AC volts. The track feeds at that location were as I surmised, the wrong polarity existed. So I rewired the outputs of power district 1 and 2 by swapping the wires coming out of the NCE EB1's and ran a train over that block boundary again, and all was now OK. I then fitted 4 point motors to some of the points in the northern end of Clapham Yard. I still have to fit all the wires back to a currently spare DS64, that will control the first 4 point motors. I think I will need at least another one DS64 to allow completion of Clapham Yard and most of Loco Pilly. The wiring of the point motors at the northern end of Clapham Yard is probably a job for next Sunday. Some of the other major work required before the next running session is that I need to find the power feedback between power districts 3 and 4 and also install the various wire droppers to the power bus in those districts. There is no use installing an NCE EB1 for short circuit protection and having a power bus running the length of the track section - maybe 20 metres of track and only having a single connection to the track from the power bus and having the rails as the only conductor for the whole layout. It has worked satisfactorily up until now, but it really needs to be wired correctly. Today I went to our Club's Buy and Sell and sold a few wagons and strangely for me, I did not purchase another loco or wagon or even a building. How was that for self control. There were a good number of sellers and quite a few buyers. I think everyone left happy. Upon return home, I went down to the shed for about one hour and re-attached a KD coupler that had fallen off a wagon. I then set about enhancing my railset train. This permanently attached 8 car train has KD's for the ends and between the middle wagons. The rest of the wagons have dummy knuckle couplings. I removed the dummy knuckle couplers that were between all other wagons and replaced them with standard KD's. That should make this train a bit more reliable. Next week I will be spending some time at Clapham North wiring up another four point motors and creating the control panel for that area. I will also work on droppers from the power buses for power districts 3 and 4, as well as trying to find that troublesome cross connection. The Bridge Works - now for a lot more. Went down to the shed before lunch today and installed the water pipe to enable the good people of Cassino to get fresh water. The pipe runs across the Richmond River Bridge. I then cleaned the track and then got down to running a few test trains across the bridge. First a single loco, then a double header and finally a triple header. The layout has not been run for a number of months and with all the work being undertaken around the river crossing, there was quite a bit of plaster dust that had settled on the track and caused it to be slightly intermittent in a few places. So after lunch I went back down to the shed as promised to run a few trains for the blog. To keep me company, I had the TV on to watch the Bulls beat NSW in the one day final as well as switching back to forward to the V8's down at the Gold Coast. Well in the first video, my son run the train while I captured the footage. This was followed by a container triple header container train heading to Clapham Yard. While I was positioning the trains, I was making notes of items that need to be fixed prior to the next session. There is still quite a lot more work to do at Clapham Yard. I removed a set of points and never replaced them. I will also need to install about a half dozen point motors at the Northern end of the Loop and create the panel to control them. This will allow the semi-automated control of trains through the Loop as well as into Loco Pilly. It seems that some of my point motor addresses has gone awry. While throwing some points for Acacia Ridge Yard associated with the arrival of trains into the Yard, points in Clapham Yard were firing. Whoops! I will have to review the point motor addresses set here. I will also be putting out feelers for the running crew for the next session. I will see on what day I can get the greatest numbers of attendees. It will either be the 27th, 28th or 29th of December. Next Sunday is the RMCQ Buy and Sell at the RMCQ Clubrooms starting at 11:00am. There will be plenty of NSW stuff for sale. Today Shelton and I went to Anthony’s layout – The Border District. http://borderdistrict.wordpress.com/ This layout is based on the Victorian and South Australian Border region in around 1976. We were joined by Mark another VR Modeller for the running session. So today I was the odd man out. I got the job as being the Station Master at Tatiara Downs. I had to co-ordinate with Train Control for access to the mainline should a shunt engine need to do that, or to go from one side of the station to the other, as well as ensure that any crosses that occurred went smoothly. It was quite common for one or both of the trains in the cross to also need to drop off and/or pick up loading at the loop as well. The station is signalled with two position lights. There are also a third aspect that allows shunt movement, either to the headshunts at either end of the station or out onto the mainline. I had at least 7 trains through the station while I was there, as well as one train each leaving from the dock platform or the yard. There were two locomotive change over jobs as well, with swapping of SAR and VR motive power occurring. At times it was quite full on and without the help of Train Control I could not have done it very well. All wagons have wagon cards that advise where the wagon needs to be placed, or sent to. During the Operating Session apparently some dodgy loco driver actually let a light engine movement to the loco get out of control and he collided with a parked T class and sent the T class careering into the turntable pit. That person certainly needs to smarten up his act. Later on in the session another driver went through a set a points that were not set for him and ended up derailing a GY (I think) wagon. I think this railway needs to ensure that better qualified drivers are employed for future operating sessions. It was a great day with great people. Thanks Anthony for the invite. I had a great time. I think I actually learnt something. As I have been doing quite often of late, I made my way over to the local hobby shop in the hope of buying a few things. I needed some styrene tube so I could manufacture the water pipe that will run across the Richmond River bridge. No doubt this supplies the other side of Casino across the Richmond River from the water treatment plant. I plan to have my pipe removable as my river crossing is removable in three sections - the girder section to the south, the Pratt Truss in the middle and through girder to the north. I inserted some 1.6mm rod into one end of my purchased styrene 3.2mm tube and glued the rod in place. I can now thread all the 3.2mm lengths of tube together (elephant style) to go across the bridge opening. I have now sprayed the water pipes silver. I really need to weather them up as I have pictures to the real ones and they are not really silver. They are a dirty colour. The water pipe I am modelling is visible in the centre right of this photo of the Richmond River Bridge from the northern bank. I took this photo about 8 and a half years ago. While at the hobby shop I splashed out and purchased a length of Micro Engineering bridge track in code 70 profile. I had planned on laying my own code 70 weathered rail across the bridge on my own stained up sleepers, but I didn’t think I had enough sleepers left. I think I will save them for a few small bridges in other locations on the layout. So when I got home from the hobby shop, I trial fitted the bridge track across the Pratt Truss base. I had to cut the sleeper webbing in a few places, so I could slide the sleepers back and forward so I could make the track fit properly. The bridge has a few raised sections that needed to take the place of a sleeper, so I needed to push the sleepers out of the way. I used aquadhere to join the track to the bridge and left it over night to dry with a weight on it to keep it flat. Today I fitted the pratt truss bridge across the opening. I also laid some weathered code 70 rail across my through truss girder bridge. I now have the structure across the Richmond River complete. I think everything is basically level. I might have to pack the bridge in a corner or two. I have run a container wagon and two eureka cattle and sheep wagons across the opening and I currently have no issues. There might be a few small bits of fine tuning to do before I run a track rubber across the opening to remove any glue residue and can then run my first powered train, before I run a triple header across – with my fingers crossed. Today I also started installing the guard rails across the bridge. Again these will be in three separate lengths similar to the bridge sections so I can remove the various sections if required. I need to remove the bridge sections at least once in the future when I take the bridge to our Annual Modelling Competition at our Clubrooms in December. There are no photos of my work this weekend. I might film the first powered crossing of the Richmond River next weekend and put it up on the Blog. Late this morning I headed out to the Buy and Sell run by one of the model railway clubs on the southside of Brisbane. I met up with Darren, Paul and Geoff, as well as a quite a few other people who said G’day to me. I didn’t buy anything, but I saw Darren and Paul carting away handfuls of good bargains. Next Saturday I hope to install the water pipe permanently and following that, head over to Shelton’s so we can both make our way to Anthony’s place for a running session of Victorian and South Australian outline rolling stock. I might have to charge the batteries in my Procab-R in case Anthony has installed radio since his last running session. Well what has happened in the last week? I received a phone call on Friday night from a Club member asking how my decodering up of his locos was going. Whoops! I forgot to do the last two of his six locos - I could not get motivated. So after I hung up the phone I installed the decoder into one of his Jumbos and on Saturday morning before I left for the Club, I did the last loco also a Jumbo. So in total I decodered up 2 x 80's, 2 x 421's and 2 x 442's. On my way to the Club via the local hobby shop I picked up my Central Valley kit of webbed girders so I could progress my bridge over the Richmond River. During the week, I was lucky enough to convince the boss to pick up two spray cans of grey primer from one of the local cheap $2 shops, although the tins of spray paint where about $4. I think Supercheap Auto had similar cans on special this weekend for cheaper. I realised the need for spray paint during the week when I thought I might be able to spray paint my girder bridge one night after I came home from work, but I had no grey primer available. So I was able to sweet talk the boss into picking some up for me. Yesterday at the Club and we spent lots of time talking about the progress of the Clubrooms layout. Maybe I should take a few photos of the Clubroom HO layouts progress at the November meeting and post them here on that weekends Blog. So this morning while watching Bathurst and cheering for Ford, I glued 6 webbed girders together and then cut them to length for installation on the bridge. I then added the angled girders in between glimpses at the TV. When that was complete I then went down to the shed and painted the small girder bridge grey. Once that was dry I glued on the sleepers and set it aside to dry again. The completed bridge in place on the layout. My efforts then turned to the Pratt Truss bridge. The bridge ready to paint. I followed the old adage - Divide and Conquer. So I then separated the Pratt Truss bridge into its two pieces, the bottom and the top. I then painted both. The top was pretty easy. The completed top half of the bridge. The bottom proved troublesome. As I spray painted it, there was bubbling of the styrene occurring in a couple of places. On closer inspection there was a plastic type cover on the styrene that was not previously visible. So I tried to scape that away and repaint the affected areas. I then found three other places where there was a plastic type cover. So again these were removed and the styrene touched up again. The eventually completed bottom half of the bridge. The two halves were then reassembled. I am quite happy with how it turned out. I then took the bridge over to the Richmond River opening and put in place to admire my work. In place across the Richmond River opening. Now the driver's eye view. Looking from the northern side of the River. So I've had some great progress, but still more to do. I have some sleepers to add across the bridge next weekend and then also try and add the rail across the bridge. However, I will have to permanently fix the two main bridge piers to the base of the layout with some sort of glue before the bridge is finally placed into position. But the bridge will need to remain removable as I need to take it to the Club in December. I still need to make a few minor adjustments to how the bridge will sit height wise. I also need to add the water pipe that runs across the bridge to make it accurate. With a bit of luck I will be able to run a test train across the bridge again next week. Tuesday Nighters this week is at Lefty and Son's. I wonder what they have done since we were last there. Will we be in for a surprise? I had Friday day off to do a few things with the family and eventually got down to the shed on Friday afternoon. I did a bit of plastering and set the girder piers in plaster to the correct height across the River opening. I then took two lengths of code 70 rail and used some PC board sleepers to keep then at the correct track gauge. I still have to cut the gaps on both the top and bottom of the PC board before I permanently fix this to the bridge. Before this I will stain up some bridge transoms and glue these to the bridge after it is finally painted. This task is still a few weeks away. On Saturday morning I added a bit of plaster to the northern face of the embankment of the Richmond River. I then got a out my trusty paints and painted the white plaster on both sides of the bridge a base colour. I then hit the various piers with my trusty grey stain that I use on all my plaster and wooden items. So the two main bridge piers and the four smaller piers on the southern side were all stained up. I'm now out of stain so I will have to make up another batch for when I do the bridge transoms. The overall view of the river crossing. A drivers view as he approaches the bridge. A closer up view as the driver is about to cross the main span. Many years back I started on scratch building the northern span of this bridge from styrene. It has been sitting in a half finished state for years. Every time I pick it up, the bridge just feels too flimsy. So I have now been turned off using this version of the bridge and will make another one. The half finished scratch built flimsy bridge section for the northern end. I went looking around the shed to see what I had. I came across two bridge girders that I had purchased at a buy and sell, again some time ago, that I think I will use in my next version of the bridge. I will use some rectangular styrene shapes and some 'I' beam that I will scavenge from the original bridge. I'm just short of the rectangular shapes. Hopefully I will pick these up during the week at the hobby shop in town. The trial fit of the bridge girders for the northern ends bridge. You can also see my code 70 track with a couple of PC board sleepers keeping it in gauge. My long awaited for Central Valley kit arrived on Friday at the local hobby shop but has not been unpacked as yet. I will hopefully pick the kit up next Saturday. That will enable me to spend some time next Sunday putting together some extra cross girders together. I have six of them now but need another six to complete the bridge. This will allow me to resume building the bridge so it can be completed before our Club's December meeting the date of our annual Christmas modelling competition. So after girder fitting, it will be painting, adding a few detail plates where the various girders join and then add the screws to join the top and bottom structures. This will be followed by fitting the stained bridge transoms. Still plenty of work to do yet. I came home from work early on Friday and decided to head down to Jaycar to pick up some heat shrink. The family came with me as we were to check out the car yards at Browns Plains after the stop at Jaycar. The Bosses car is approaching 10 years old, and the plan is always to swap them over about every 10 years or so. Anyway we got out of our estate and onto the highway and then all of a sudden the in car computer started complaining that it was overheating. Oh no! So I coasted down to Jaycar went inside to have a look around and pick up my heat shrink. So upon leaving the shop when I started the car again the temperature was back to normal so we left Jaycar and then no sooner had we left that car park and the car computer started complaining again. So we drove into the next shops carpark and then called RACQ for roadside assistance. These guys do a great job! After about 15 minutes they turned up and it looked like the fanbelt had shreaded and had taken the water pump with it to the great big used car part place in the sky. It was a tow home job. Luckily only 5.8km from home. So while I awaited the tilt-tray to turn up, the wife and kids started walking to the Browns Plains bus stop and caught a bus back up to the main intersection with our suburb and then a walk of a couple of kilometres back home. The bus driver allowed the kids on for free while the boss used her GoCard. About 20 minutes later the tilt-tray truck turned up and the female driver loaded my car onto the back and gave me a lift home. We reversed the car into the garage and then called Lube Mobile to see if they could do some magic on Saturday morning some time. Well as it turned out, they arrived at 8:00am on Saturday and while they were there making the car run again by removing half the equipment in the engine bay in order to get to the water pump, I got them to do a scheduled service at the same time which was also due as well as replace the five year old battery as it was on its last legs. So for the just a bit more than the cost of an Auscision XPT set, my car is back on the road. So while the mechanic was performing major surgery to my car, I put the heat shrink to good use and I attacked 4 locos – 2 x 80 class and 2 x 421 class and installed decoders and wired up the headlights at both ends via a pair of 220 Ohm resistors. This work is for a fellow Club member whom has a number of locos to be decodered up. I had to try and claw back some of the money I spent on the car somehow! I still have two 442 class locos to do, but they take about 10 minutes longer to do, as you have to remove the couplers to get the shell off with those models. We did never get to the car yard on Friday. However, on Saturday afternoon, to give my car another test run, we made our way down to the Browns Plains car yard magic 400m section of the highway service road. There were about 5 or 6 different car yards all with new and used vehicles on the service road. We went to all of them and the wife will spend some time over the next few months refining her colour choice and car make. Today I went out and picked up another 20kg bag of casting plaster at Bunnings and put it to good use doing some more plaster work in the shed, terra forming the terrain on the southern side of the Richmond River bridge. On the subject of bridges and my long awaited Central Valley trusses, I understand that they were to ship this weekend from the states. So at this stage, I have no idea if they will be available for pickup next Saturday morning from the local hobby shop. We can but hope. So after lunch I splashed a bit of plaster around at both ends of the Richmond River. I also took my rice cake piers - sorry hebel block piers and cut them down to a more realistic size slightly. I then tapered them from bottom to top along both planes so they were more realistic. I then tried to coat them with plaster to get a smooth covering. This took some time, but it seems to have worked. We will see once they have dried and I will use a file to smooth out the rough bits. During this week I'm pretty sure I will find time to clean the piers up and give then a coating of my colour all stain. I can then look at fitting the piers permanently to the layout. Back on the subject of the Auscision XPT set, I will be putting in my order tomorrow, as they announced last Tuesday on their Facebook page that the price will be going up from $895 to over $1100 for the basic set. So I will be locking and loading Eddie! Of course I will also be ordering two extra wagons and I would dearly like to order an additional motored power car, but I would like to order the Casino power car (I wonder why) which is not separately orderable, even though they spell it the wrong way, and given my luck, it will be the non-motored power car as well. I won't be doing much model railway related activities next weekend as it is a milestone Birthday for the boss. So we have activities planned with the family on Friday, Saturday and Sunday. I might need a day off the week after to recover! Today I went down to the Shed and got stuck into scenic opening across the Richmond River at Cassino. As stated last week I removed the piece of pine that previously carried the track across the opening. Because of this, trains cannot run in this section at the moment. I temporarily placed the bridge piers and my bridge girders on the southern approach bridge. I then rested the not yet complete bridge on the plaster cast piers and temporarily installed a girder section on the northern approach. Below is how it looked. This is a photo of how it will look when completed. The same scene from a lower perspective. A bit of a close up of how it will look. I laid two pieces of code75 rail across the bridge girders on the southern side of the bridge for a test. So I cleared out the area and got started throwing a small amount of plaster around to blend the southern side of the embankment into the scene from the previous ground level down to the new waterline. I have now run out of plaster. I've had it on my shopping list for some time to buy another 10kg bag of casting plaster but I have not been to Bunnings lately. The opening all cleared out after the first bucket of plaster had been thrown around. After I had let the plaster set for some time, I thought I would try and make the bridge girders sit on their piers. The piers are made from Hebel block. It is so easy to cut. Someone gave me a small piece many years back and I had always planned to use it in this location. I might have to go and get another block of it and replace some of my other piers in the future. The test run of the piers and girders following the first splash of plaster. I was thinking about installing the rail for this section across the four girders. So I took the girders and a length of weathered code 75 rail to the workbench. I installed a home made track gauge made from a PC board and rail joiners soldered to it, onto each end of the code 75 rails, and turned the rail upside down and applied superglue to one girder length of rail. I then placed the rail on the girder and used another track gauge running up and down the rail to ensure it was all in gauge and the track was centred on the girder. I then did the same to the next girder and so on until I had four girders laid with a section of rail across them. As I went I used a Eureka cattle wagon and a Eureka sheep wagon as test vehicles on the workbench to ensure that they did not fall through between the rails. I then installed the girder section onto the piers and then I needed to cut a section of track between the point into the Bonalbo Sleeper Siding and the girders. This was cut and the track all joined up. I then did a few test runs of the Eureka Sheep and cattle wagons and two 80 foot container wagons through the southern side of the bridge opening. So far everything works well. The track laid up to the main bridge span. I still have to trim down my bridge piers and then paint them. There still needs to be a bit more plaster installed behind the piers and of course when the piers are ready to be positioned finally on the layout, they will be laid into wet plaster and I will ensure that they are installed vertically. I also have to ensure that the bridge girders are as near as possible to horizontal across the opening as well. So at the moment these are exciting times as I progress the track back across the Richmond River. I will have to seal the river base then and look at what I will use to simulate the water. But I'm in no hurry to accomplish this task. I am hopeful that my Central Valley girder kits will show up next weekend at the local hobby shop, but I am not that certain they will. I think I might still have to wait another fortnight. I really need them so I can progress the bridge which is my entry in our Model Railway Club's annual Christmas Modelling Competition held in early December. I'm off to Canberra tomorrow afternoon and back on Tuesday night, so I will perhaps get some time to do some reading of the latest AMRM. I do enjoy this magazine. See ya next week! Yesterday when I went to the shed to fire up the layout, I encountered enough another short when I fired up the layout. Yes it was in power district 5 again - the Acacia Ridge to South Brisbane section. So in an effort to quickly divide and conquer, I disconnected the DS64's and still had the short. I did some more investigations and eventually about an hour later I tracked it down to a section of track in the southern end of Clapham Yard that had expanded in the recent heat and the short section of rail about 1" long, had jumped out of a plastic insulated joiner and was touching the frog end of an electrofrog point. I replaced the insulated joiner, and cut about 2mm off the troublesome short section of rail and replaced it. I then did another test and everything was working as designed. I also spent some time looking at power districts 3 and 4. Section 3 is from just south of the Cassino Meatworks to north of the Kyogle Stock Siding, and section 4 is from Cougal Spiral to Acacia Ridge Yard. Well it seems these two sections of track are interlinked somehow. If I turn them both off, they are isolated, but if I turn just one off, then power is still in the sections. I traced one of the power buses, but could not find any cross wiring to the other section of track. There is definitely a section break between the two sections. I will put this on my to do list so hopefully I will have this resolved in the next few weeks. Last night I did a bit of maintenance on a dual gauge point I had made a few weeks back now. I adjusted the third rail slightly and then re-glued it down. I then ran a few 12mm bogies through it and then a standard gauge bogie and it seems to be running better than ever. This point was the last point I had installed in the northern end of Clapham Yard. This was the first point removed as the suspected culprit of the recent short in the Acacia Ridge to South Brisbane section a few weeks back. I will eventually get around to replacing that point in the next week or so. Today I made my way down to the shed just before midday convinced I was going to solve my short issue in section 5 of the layout – Acacia Ridge to South Brisbane Interstate. I checked and it was still there. I took all locos from the track in that section. There was a triple header 48+45+48, double Jumbos, a 73 and a CHP + CTH set. I had no idea how I was going to resolve this issue. Nothing was visible. So I started measuring resistance between the rails. There was some about 1700 Ohms. I split the track bus in half where is it fed from my EB1, disconnected it was the EB1 and split the track as well. I measured the southern half of the track from Acacia Ridge to Dutton Park and it had no resistance – an open circuit – Great. That means it is at the other end. Just because I hadn’t done it before, I decided to disconnect the four DS64’s from the track bus. Another measure and now there was no resistance on the section from Dutton Park to South Brisbane! So the short was related to powering the DS64’s. I reconnected the track and track bus to the EB1 and the section started properly. I connected the DS64 for the Park Road Sidings and tested again. Still OK. I connected one of the DS64’s at South Brisbane and still OK. It was now narrowed down to one of two DS64’s. I connected one and the short reappeared. Gotchya! I disconnect that one again and connect the other and there was no short. So now I knew where the short was – but I didn’t know what was causing it. I inspected the DS64 and nothing was obvious. It was upside down under the basebaord, in a dark location and my eyesight is not what it was like about 3 years ago. I disconnected one of the wires next to the point motor common connection and fired it up again. No Short. I think I found it. I think I had a small strand of wire bridging the common and one of the actuation wires. I tidied it up again, reattached and retested and it worked. Whooopppeeee!!!! Success! After that success, I thought I would install the section isolation switches for each of my five EB1’s controlled Power Districts. I first needed to cut a whole in my facia to install the five slide switches. This was followed by taking the wire that went from the EB1 to the track bus for each of the five sections and connecting that to the centre of the slide switches. I then installed five wires, one from the top of each slide switch back to the where the previous wire came from the EB1’s. A quick test revealed that four of then worked as designed. My section from Cougal Spiral to Acacia Ridge does not have its staff machines shut down when I operate the slide switch for that section. There must be another sneak path bypassing the EB1. I will review that issue next week. I think I have had enough success for one week. After a quick session watching the V8’s on TV and playing with the kids out the front with the soccer ball, I returned to the shed and started looking at the bridge over the Richmond River at Cassino. I have now removed my temporary wooden bridge and done some surgery to the scenery on the southern side of the bridge. The original opening that I had made for the base of the Richmond River is not wide enough as I have built the bridge to its scale 180’ or 630mm size. I added about 120mm of foam to the flat river bottom base. I have had to shape the wooden southern bank to a sharper angle after I cut off about 150mm from that. I will post some photos next weekend. I am still waiting for my order of Central Valley girders to arrive at my local hobby shop from the US. Apparently they are sitting in a shipment at a straight forwarder still in the US, awaiting more items to build up its weight. I don’t think they will be here next weekend either. Time is running out for me to finish this bridge for this year’s club Christmas Modelling Competition. During the week my DS64 returned from its vacation at the Digitrax factory and apparently has been fixed under warranty by replacing the FETS. I also had a bit of a win in our work’s footing tipping competition. I came equal 8th with 8 other people and got approximately half my money back. Two more successes for the week. This week has again been very light on with Railway related activities. Some activities did occur on Tuesday night with the guys coming over for our regular Tuesday Night get together, this time at my place. Just as the guys started arriving, I removed what I thought was my troublesome set of point that was causing the short on the layout. So after removing the points and reconnecting the track bus, it looked like everything was now back in working order. We had a great night. I was showing off my Richmond River Pratt Truss bridge with my triple header test consist running back and forth across the bridge. Lots of good conversations, plenty of people bagging me about my lack of space in the shed to sit down and talk and a pretty late night for the last lot of guys to leave. On Saturday morning, while I was at the kids school cooking the BBQ for the polling booth, helping to raise some money for the school, my wife turned up and advised she had no hot water at home for her shower. When I eventually got home and checked out the hot water system, there was water streaming out from the top and down the side. That was not looking good. I made a few phone calls and so until Monday morning, no damn electrician will get off their big fat well paid @r$e. At least I did get 20 years of the old hot water system. Not so bad! So cold showers for everyone now until at least Monday. If any longer and I will go buy a camping shower. Early this morning while preparing for a family BBQ at our place today, I was wheeling the BBQ over to where it was going to get fired up and guess what, two of the wheels (the front swivel ones) fell off! I have tried to re-attach them, but they are very dodgy. Damn cheap foreign import equipment. At least the BBQ still works. We had a great lunch today. I am sitting here almost too stuffed to move. It was great catching up with the Missus' Family and a few of the kids cousins. This afternoon before I fired up the BBQ when two of my Brothers-in-law came down to the shed this arvo to get their first drink of the day, and I fired up my layout to show them it running - nothing happened. That damn short had re-appeared in the Acacia Ridge to South Brisbane section of track. I could not get it to power up. AAAAAAAAAAAARRRRRRRRRGGGGGGGGHHHHHHHH! Not happy Jan! Anyone want to subcontract the fault finding for this damn short circuit? Yesterday, between cooking the BBQ at the school polling booth, and heading home to see what the hot water system gods had dealt me, I headed over to Austral Modelcraft and picked up another NCE EB1 for the fifth power district of the layout - district no. 4. Today after the BBQ, I installed the EB1 into the layout power bus, but still need to connect it to the track bus for the Cougal Spiral to Acacia Ridge Yard power district. I think that will be after I get a working hot water system, as it can be very sweaty work under the layout doing the soldering of the track bus. Possibly a job for next weekend.